The Montana Indoor Soccer Championships were held in Kalispell Montana on March 2-4, 2018. Boys and girls teams U 12 – U 19 from across the NW USA and Canada competed indoors at Flathead County's 45,000 sq. ft Tradecenter Building on professional turf fields using the international futsal rules, regulations, field size and equipment. 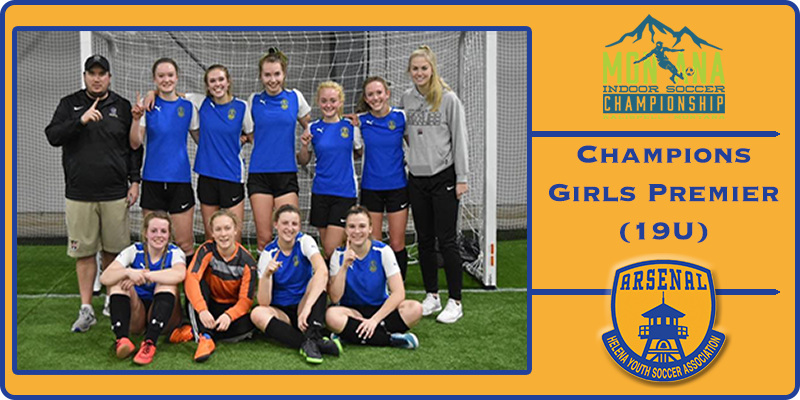 Ten members of the Helena Arsenal 19U Girls Premier team traveled to Kalispell for the inaugural Montana Indoor Soccer Championship and emerged as the 5v5 tournament Champions. This team, coached by Colin Baker, won all five games with an overall goal differential of 46-7. In their first match of the tournament, Arsenal took on the NSC Montana Purple team, winning 8-1. Goals were scored by Ashley Carlson (3), Katie Martin (2), Tristin Soule, Ellie Stiffler, and Francie Tupper with assists by Kinzi Adams, Isabelle Melton, Soule, Stiffler, and Ellie Stock. Arsenal next beat the KEYSA Rovers from British Columbia 11-0. Goals were scored by Hannah Bowers (2), Adams, Carlson (2), Martin, Stiffler (3), and Tupper (2) with assists from Carlson, Martin, Stiffler, and Stock. Arsenal continued its winning streak on Saturday afternoon, beating the NSC Montana White team 6-2, with goals from Carlson (4), Stiffler, and Tupper assisted by Carlson, Stiffler, and Martin. Arsenal’s last pool match against the Flathead Force ended up 12-1, with goals by Adams, Bowers, Carlson (7), and Stiffler (3) assisted by Melton, Stiffler, Stock, and Tupper. In the Championship game, Arsenal again faced the NSC Montana Purple team and emerged tournament champions after winning 9-3. Goals were scored by Adams, Bowers, Carlson (4), and Stiffler (3), with assists from Adams, Carlson, and Stiffler. Ashlin Slanger manned the goal in all five matches and was a force to be reckoned with in the net. The Arsenal 19U Girls premier team, comprised of an all-Varsity roster from Capital High and Helena High, begins its regular season on April 7.